I went out for a walk today at work with my friend Lucia and when I got back to my office, I had e-mails, texts and videos from both my wife and neighbor telling me that BnB2 had swarmed. I had looked in the hive on Saturday and it didn’t look like any of the queen cells had hatched, but there were probably more cells than there should be and there were definitely plenty of bees so I was kind of worried they might swarm. I left work in a hurry and drove home as fast as I could to see if I could put it into one of the spare mini (nucleus) hives I have on hand. It’s a 35 minute drive from work to home and since this was the first swarm I was going to catch, the drive gave me plenty of time to plan out how to catch the swarm. My biggest concern was that the swarm would fly off before I got there, but when I got home, it was still hanging in the crab apple tree next door. Of course, I kept ending up behind slowpokes on the road which only made the anxiety worse. Swarm hanging out in the crab apple tree next door. It was a small swarm (probably about 2 lbs – smaller than a package) but it was in two clusters and I wasn’t sure which one had the queen. 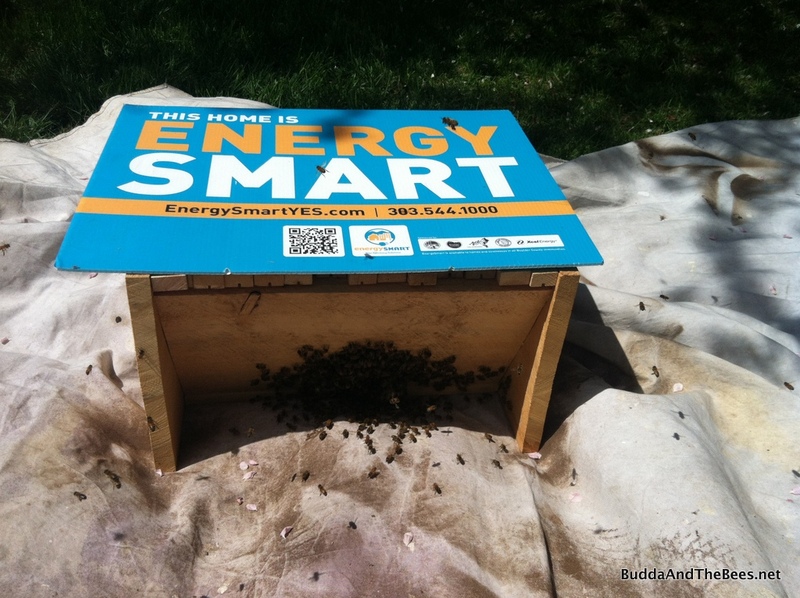 I put down a tarp and put a board between two ladders, placing the hive under the swarm. I stole a couple of empty combs from Duncan’s hive to put in the nucleus so they would feel more at home. Once I got things all set up, it was just a matter of shaking the bees down into the hive body (at least in theory). After the initial shake, there were still quite a few bees back up in the tree, so I did another shake to get the stragglers. I put the hive down on the tarp and let the bees that missed the hive on the shake walk in and set up shop. I put the bars back on top and closed up the hive except for one entrance hole and will leave it there until after dark. I put up a temporary stand for the hive in the bee yard until I can build a bigger hive, or a more permanent stand for the nuc. I used an old sign I had laying around for a cover, advertising the efficiency of the bees. Duncan was at school, but his sister was really interested in what we were doing. 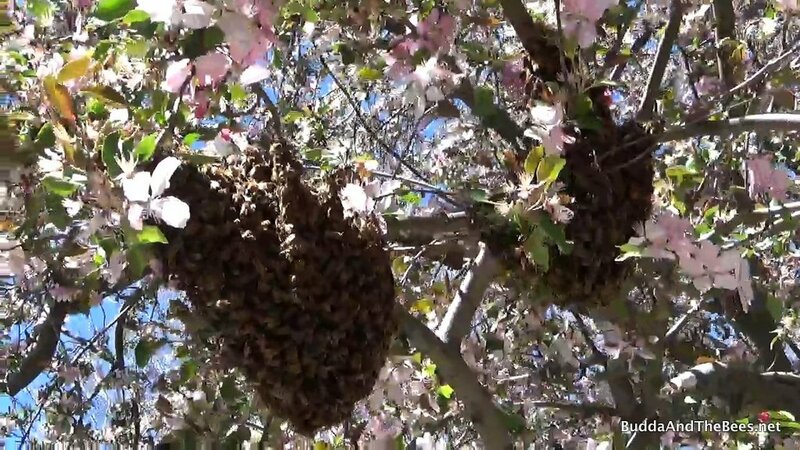 Spring is swarm season and swarms are a natural (and mostly docile) process where a colony divides itself in two to propagate a new colony. 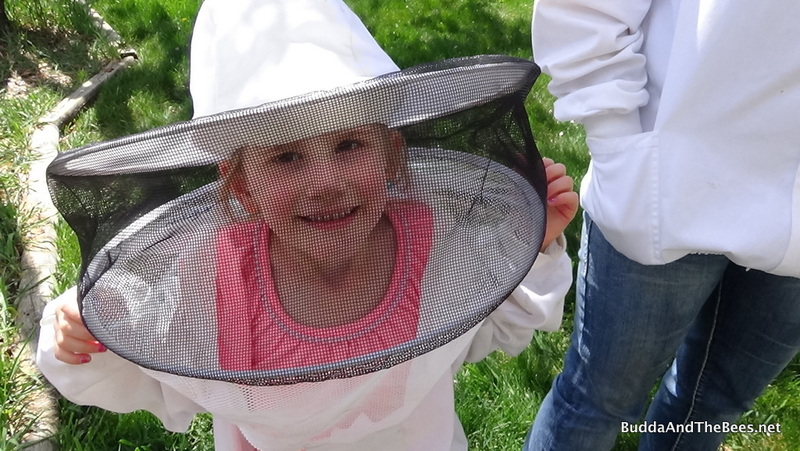 A queen and (usually) half of the bees go out to find a new place to live. In the case of BnB2, I’m guessing that one of the queens hatched and they swarmed, but that the queen is still a virgin. I don’t think there has been enough time for her to mate with drones. There were two combs in BnB2 with queen cells – one near the entrance and another further back. I’m thinking that one of the queens hatched in the comb near the entrance and that one swarmed with the workers. The other may or may not have hatched, but I’ll check in the hive in a week or so, after we get through an extended period of rainy (and maybe snowy) weather. So, this all ended well and I didn’t lose any bees. If all goes well, the queens in the nuc and in BnB2 will get mated and start laying and we’ll have plenty of bees to pollinate our gardens. But for now, it’s time to sit back, relax and enjoy the warm weather. 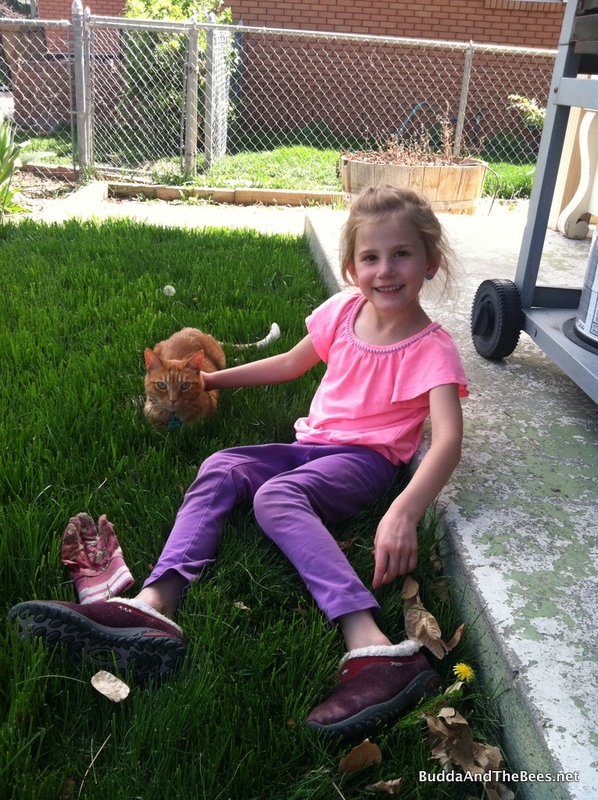 Alayna relaxing with Yoda the cat. So cool! I’ve been eagerly awaiting this post ever since I saw Diana’s video! You (and your amazingly adorable helper) did an awesome job. They just plopped right in. Neat! Congrats on your new colony!! !